Home Blog Fancy yourself as a top 4 Premier League manager? Prove it. Whether you’re flat 4-4-2 or high press 3-5-1 tactician; winning titles, scouting talent, developing youth from the academy, and restoring glory to our clubs, is the job we all dream of. 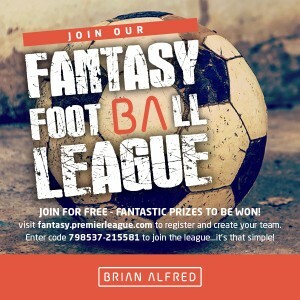 So why not show off your managerial skills and top our Fantasy Football League – The Brian Alfred Rebate League, to bag yourself £50 CASH?! If you think you’ve got what it takes, enter your team to our league 798537-215581 here today. So, say goodbye to your winter breaks and tiki-taka tactics, this is the most physically demanding Fantasy Football League in the world. The places are those determined by the main Premier League site and their decision is final. You must be following Brian Alfred on Facebook or Twitter to participate. If points are level at the end of the season or during end of month commotion e.g. “Manager of the Month” the winner will be decided in fair manner by Brian Alfred. Winner will be announced and contacted at the end of the season.